Kocks Ardelt Kranbau GmbH is a member of the Kranunion group of companies and has been building cranes for more than 110 years. By using the experience gained from supplying several thousand harbour cranes over this time, Ardelt has advanced to become one of the leading manufacturers of lifting equipment for handling bulk materials. In particular, the development of the double jib level luffing system together with the integration of hoppers and unloading equipment into the crane system, are key- factors behind the advance to achieve higher handling performances and unrivalled efficiency. The Tukan K is a unique, compact ship-unloader. The design configuration allows for very short cycle times between hatch and hopper coupled with best control of dust for cargo such as coal. Naturally the cranes are equipped with power regeneration to ensure the lowest possible cost per tonne moved. Two of the largest Ardelt cranes have been operating successfully in Wilhelmshaven, Germany for the last three years. The primary task for both cranes is the unloading of coal carriers for supplying a nearby power station. These cranes are able to achieve a free digging performance of up to 2,400tph (tonnes per hour). The established double jib level luffing system with its short rope lengths, provides precise and fast positioning of the grab. 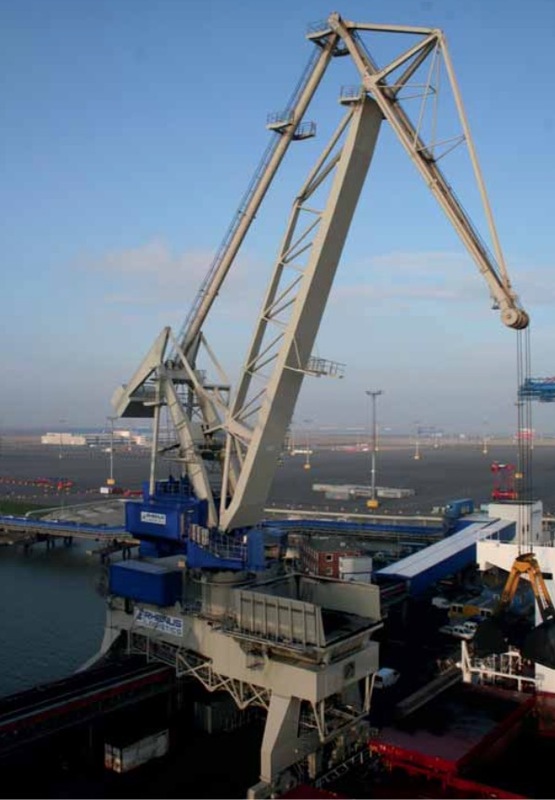 The grab used at port of Wilhelmshaven is a four- rope grab manufactured by Verstegen and has a capacity of 44m3 with a deadweight of approximately 19 tonnes. These dimensions are necessary in order to provide the handling volumes required. Recently two more cranes of the same size went into service for voestalpine in Corpus Christi,Texas. These cranes will handle Capesize vessels laden with iron ore pellets. The cranes were selected thanks to their compact design which eliminates the need for a separate hopper, freeing up valuable quay space and also enabling the working of adjacent hatches. The grab depth optimization system patented for Ardelt ensures smooth operation and minimizes interruptions that result from shutdown due to over-filling of the grab, or loss of performance from insufficient grab filling. Kirow is a renowned expert for railway cranes and slag pot carriers. Ardelt is widely respected for double jib level luffing cranes. Kocks is an acknowledged expert in Goliath cranes and innovator for STS container cranes.